The combination of results from week 23 mean that FC Barcelona now have a six point lead over a Real Madrid side who now find themselves in second place. With the draw in San Mamés against Athletic and Atlético’s defeat in the Madrid derby in the Wanda Metropolitano, the blaugranes now have a six point lead over Santi Solari’s team, the same lead they had over Diego Simeone’s team. 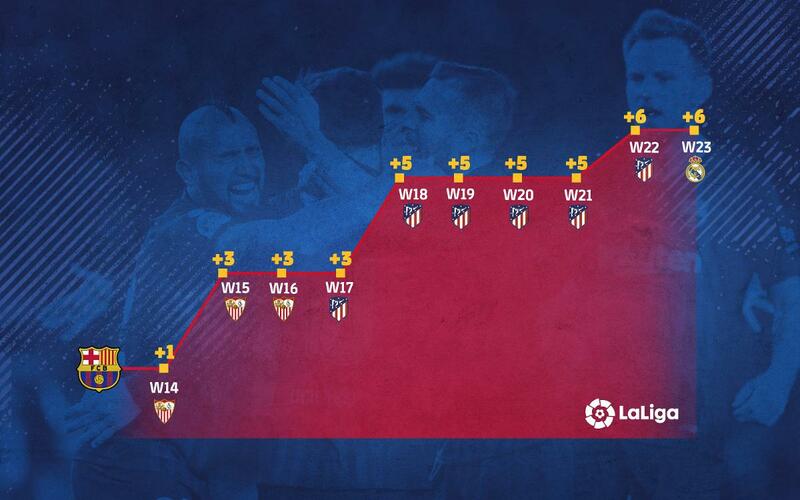 Barça have been leaders of La Liga since week 14 and their advantage has grown little by little. After a tight battle at the top from week 3 to 14, the team have now grabbed the lead and increased it slowly but surely. Ernesto Valverde’s team are on a run of eight wins and two defeats in the league and that has helped to build their lead at the top from three points between weeks 15 and 17 to their current cushion of six points over first Atlético and now Real Madrid.